You've been in the car for what seems like hours. You're far from home. You're hungry. Where do you stop for a quality bite when you're not feeling the fast food? We have no idea. That'd be Lyft and Uber drivers. They often work long shifts, sometimes driving for 10 to 12 hours, with unpredictable routes that take them all over the city. If anyone knows the best spots for quick, cheap pit stops in different 'hoods, it'd be them. What makes a good roadside eat? Easy parking, fast service, decent prices — and bathrooms. Ideally, the food is also good. Of the drivers we spoke to, McDonald's was by far the most popular option, followed by Starbucks. They're everywhere and they usually have clean, open restrooms. Plus, Uber and Lyft drivers need to be thrifty. They aren't raking in hefty paychecks. "The dollar menu at McDonald's is a lifesaver," wrote Ann Farthing, who drives Lyft for six to 10 hours a day in the San Gabriel Valley. Daily consumption of McD's isn't the best thing for your body (remember what happened to Morgan Spurlock?). It also presents other challenges for rideshare drivers. "You don't want your car to smell like McDonalds or In N' Out," says Daniel Nolte, who drives for both Uber and Lyft. "Drive-through food can also be messy. You don't want to pick up a passenger with ketchup on your shirt. So I'm generally looking for something where I can get out of the car, eat quickly and then get back on the road. There's no paid lunch when you're self-employed." A lot of drivers told us that time spent eating is time lost driving. But they also need to get out of the car and stretch the legs. "It's little choices you make in life to not become a potato," Nolte says. Other drivers have found some creative, unorthodox ways to have hot food on the go. "I take a soup can, one of those thick chunky soups, and put it behind the battery," said Don Highley, 65, who has been driving Lyft for about three years. "Tuck under hood and enjoy when warm. I go down to the park, eat my soup and walk around for a little bit. Then I'm good for another two or three hours." As cost efficient as the soup can method sounds, here are some other recommendations from rideshare drivers around Los Angeles, for the next time you find yourself famished on a freeway. When Oscar Garcia, 38, can't go south of the border, he gets his taco fix at Leo's, which he says has the best al pastor in the city. Leo's uses a trompo, a rotisserie that slow cooks its marinated pork as it rotates. Garcia says the most authentic version of trompo al pastor is served in a corn tortilla with a slice of pineapple. "A good al pastor stand will have pineapple cooking on top of the trompo. The guy trimming the meat will cut a piece into the air and it will land on your taco," Garcia says. Some al pastor vendors, grill the meat in a pan and heat it up later but the trompo gives it a crisp edge. Leo's has seven locations around L.A., including Garcia's go-to on Temple Street and Glendale Boulevard, where they also serve huaraches, burritos, tortas and horchata. Most of the trucks are open until 2 or 3 a.m., but the Venice/La Brea spot stays open until 4 a.m.
Garcia works full time as a graphic designer in Burbank and drives for Uber on the weekends. Along the way, he has become a local taco expert. "I know which kind of meat each taco truck does best, so I can find a good taco anywhere," he says. Garcia is originally from Mazatlan in the Mexican state of Sinaloa, so he grew up eating the best of the best. "There were times living in L.A. when I would drive all the way to Tijuana for the tacos," he said. "It's all about how they cook the meat." This Japanese supermarket in a Rosemead strip mall is a mom and pop shop with a variety of pre-made meals that are perfect for the grab-and-go lifestyle — sushi, poke, pork chopped rice, bento boxes and, on special occasions, hot dishes like curry or udon. Michael Tran lives in East L.A. and has been driving Lyft part-time for a little over a year (he also works as a hospital chaplin). His route usually takes him through the San Gabriel Valley, where he found himself at Bachan's Take Out, a classic SVG Japanese spot known for its furikake crusted ahi tuna and sweet chili chicken plates. The line was too long (the restaurant gets super busy during peak hours) so Tran wandered into the shop next door and discovered Tozai. Since then, he has been a regular. "If it's a good day for me, workwise, I get the sashimi," Tran says. "It's kind of undiscovered. I haven't seen any other Lyft or Uber drivers who regularly stop there." The market also sells imported snacks like seaweed chips, matcha ice cream sandwiches and all the Pocky your heart desires. As far as supermarket sushi goes, Yelp reviewers agree with Tran. They say the fish is fresh, they like that plate of salmon sashimi and spicy tuna only costs $8.95 and the parking is free. Brian Garcia, 32, of East Hollywood says his work takes him all over the city: "This morning I was as far north as Sun Valley and as far south as Hermosa Beach." It's hard to predict where he'll be when he needs an afternoon food fix. That's why he likes California Chicken Cafe, a local fast casual chain with eight locations, including popular rideshare pickup areas in Venice, Hollywood and West L.A.
For the last few years, Garcia has been driving Uber for 10-hour shifts while earning his teaching degree at UCLA. "With the stress and the driving, I've legit gained 70 pounds," he said. Now he tries to find healthy alternatives to fast food, especially in the afternoon, when he says eating a big greasy meal can make sitting in rush hour traffic even more miserable. "You get drowsy and then it's not fun," he says. Garcia usually orders the quarter rotisserie chicken with a side of roasted potatoes and salad or pasta. The whole thing comes with pita bread and costs $11.75 to $12.25, depending on whether you prefer dark or white meat. He also recommends the chinese chicken salad, which is massive and only costs $11.50. "The portions are big," he says. The cafe also offers wraps (with vegan and veggie options), salads, soups and a highly instagrammable interior. Nathan Guillen, 25, lives in Koreatown and drives for both Uber and Lyft part-time. He says if he's ever on the westside, he makes sure to stop at Banh Mi Venice for a pork belly sandwich. Guillen has travelled through Southeast Asia and he thinks this spot makes some of the best banh mi in L.A. The Oink Mi includes caramelized pork, sauteed shallots, garlic and pâté topped with pickled daikon, carrots, cucumber and fresh herbs. That's a good amount of meat for $13. The sandwich spot also serves a fried egg breakfast banh mi with chilli mayo, a boneless beef short rib baguette with lime leaves and Thai chilis, and a veggie or vegan roasted tofu option with crunchy garlic chili oil. Sides include crisp rice noodle rolls, Vietnamese chicken salad and glass noodles. Because it's Venice, there's an option to skip the bun and put your sandwich toppings on rice noodles, for those who don't care for gluten. Top it off with a whole coconut or a Vietnamese coffee made with condensed milk. Like California Chicken Cafe, the interior is more hip than your average pit stop. Free strip mall parking. Andrew Martinovich, who lives in Orange, is one of the rare rideshare drivers who prefers to eat at sit-down restaurants. He favors Norms, the locally-based diner chain founded by Norm Roybark in Hollywood in 1949. The Hollywood and Vine location no longer exists but the diner now has 17 outposts throughout SoCal including Pico Rivera, Whittier and West Hollywood (the WeHo location on La Cienega was designated an official historic-cultural landmark in 2015 for its Googie architecture). Inglewood, Encino and Rialto branches are in the works for 2019. Choose from classic diner fare like country fried steak, sausage and eggs, pancakes, stacked sandwiches and milkshakes. It's a step up from most diner chains and most/some locations are open 24/7. Koreatown Plaza is the place to go when you're looking for quality eats at bargain prices. The mid-city stop has a little bit of everything — Korean street food, Vietnamese noodles, Chinese dumplings. It's a favorite of Mike Im, 26, who drives an average of eight hours a day for Lyft. "My personal food recommendation is the giant-sized tonkatsu from Tonkatsu House," he says. The Japanese-style fried pork cutlet is topped with spicy brown sauce and served with a side of macaroni salad, shredded cabbage and white rice for only $10 bucks (Yelpers say it's enough to feed two people). If pork isn't your thing, the mall food court is also full of shops serving speciality items. Head to Awoolim for kimbap, a Korean sushi roll filled with egg, meat and seasoned vegetables (the rice is seasoned with sesame oil instead of vinegar, so it tastes sweeter than Japanese sushi) as well as spicy rice cakes and fried squid. Or try the layered cream cake from Taiwan's Danshui region at Casella. Parking is $2 dollars with validation. Don Highley is 65-years-old and likes to mention that he has more than 5,400 Lyft rides under his belt and a 4.99-star rating. Born and raised near Dodger Stadium, he knows a thing or two about what he calls "fake" Mexican food — fake in a good way. Cielito Lindo's taquitos, Al & Bea's bean and cheese burritos and El Tepeyac are his favorites. "I don't think you can find that stuff in Mexico City, but you sure can find it in L.A.," he says. His Lyft rides often take Highley to downtown L.A., When he's not doing the can-of-soup-by-the-engine trick (see above), he treats himself to five signature rolled tacos from Cielito Lindo, on Olvera Street. "Always beef," he says. "If it ain't broke, don't fix it." He thinks the secret to Cielito's taquitos is in the oil. "They're hand-rolled and hand-cooked with very lean meat, good stuff," he says, and the best part is the "runny, tomatillo-based avocado sauce that they squirt on top, that's got a good bite to it." The only problem, Highley says, is parking. It's a massive pain in that area but he has found some tricks over the years. He suggests parking across the street at Union Station or trying the metered spots at Philippe. If that fails, there's a Chevron right there and if you're fast enough, you can pick up some taquitos while you're tank is filling up. Zankou Chicken, the fast casual chicken spot with the pungent garlic paste, has become an L.A. institution since opening in 1983. The outpost at the corner of Sunset and Normandie is open until midnight, making it a perfect pit stop for rideshare drivers. 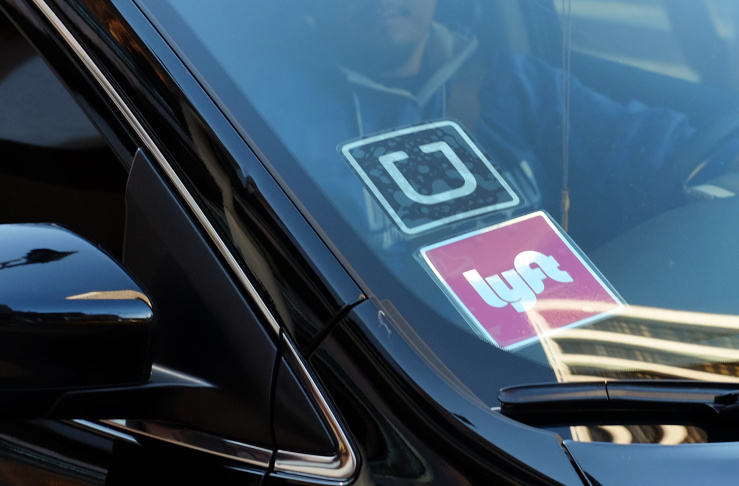 Heather Lipayon, 32, has been driving for Lyft part-time for the past five years. She lives in Monterey Park but the weekend late-night shift often brings her to Hollywood. "When you're doing a late night shift on a weekend, there aren't a lot of options that aren't a burger," she says. Lipayon likes Zankou because it always has healthy options, there's parking in the strip mall and the customer service is good. "There's always a security guard posted outside, which is pretty important when I'm a girl alone, walking to my car," she says. She usually orders the tri-tip shawarma wrap ($7.99). 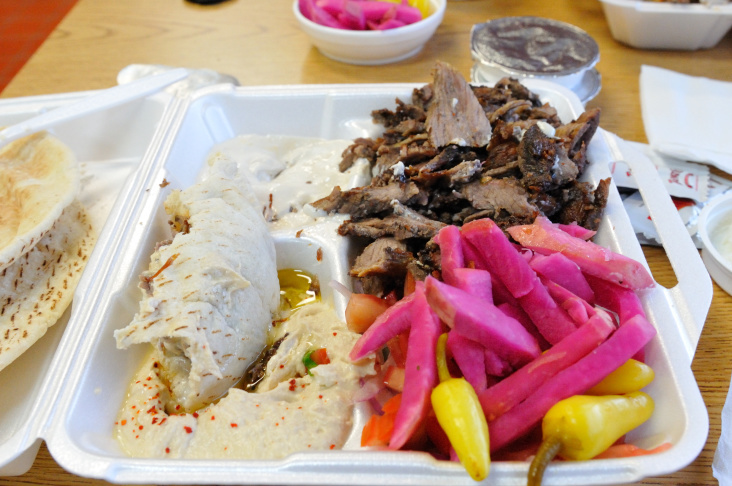 Zankou is known for its family-style roast takeout meal, which comes with a side of pickled turnips and the aforementioned garlic sauce ($22.99). Zankou's falafels and kabob wraps are easy to eat in your car or on the go. The area is also convenient for rideshare drivers. "A lot of people go to that part of Hollywood to party, so I can leave my app on when I order and wait for a ride request to come in," Heather says. The only downside? There's often along wait for the bathroom. Zankou has eight other locations around town.